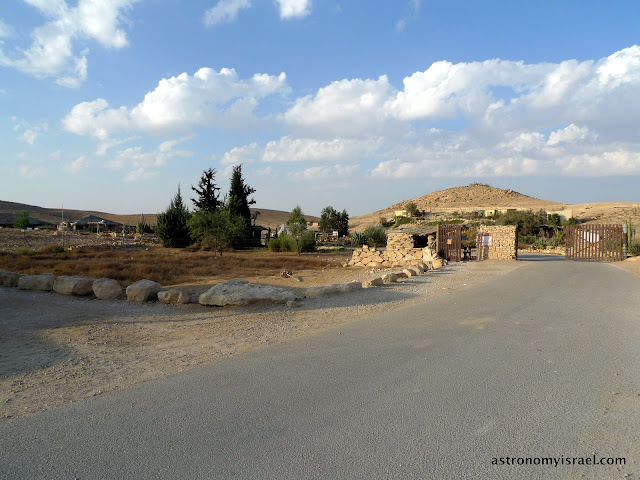 One of the places I like to observe from in Mitzpe Ramon is the parking lot of the Alpaca Farm, the only such farm in the entire Middle East. There are several hundred alpacas and llamas, together with a large variety of other animals including horses, wild asses, camels, and dogs. But what makes it interesting for astronomy is the large parking lot just outside the gates. 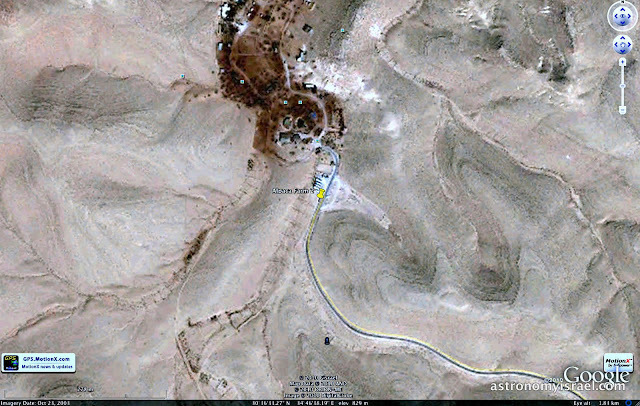 The Alpaca Farm lies in a hidden valley which blocks alot of the light from Mitzpe Ramon and also some of the wind from the desert. The parking lot is empty after dark and is large and expansive. The main problem lies in the fact that the Alpaca Farm is also a Bed and Breakfast, so they keep some of their outdoor lights on after dark. You can still easily see the Milky Way from here, and your back is usually to the lights, but still they spoil some of the desert dark sky ambience. Panoramic view of the surrounding desert and valley from the Alpaca Farm parking lot. What's that you say? You're afraid of dogs? Did I mention the guard dogs that patrol the area after dark? Actually, I've never seen them before midnight or so, but I can't promise they won't be around before then. The farm has a mixed pack of Turkish Mountain Dogs, Australian Shepherds, and other very large creatures that are there mostly to protect the live stock from predators like foxes and hyenas. (Yes, I once encountered a family of hyenas not far from where I was observing.) But they are very curious about humans, and it is somewhat intimidating to have a dozen or so very large dogs come up to you in the middle of the night, sniffing your crotch. After they get to know you some wander off but others lay down nearby, some under my telescope tripod. They make quite a ruckus when they rise in alarm at some unseen threat and race away over the deert, knocking their great tails against my tripods and generally disturbing an otherwise quiet observing session. Although harmless, the dogs have kind of convinced me to take most of my observing elsewhere. I think that's the general idea. An Australian Shepherd asks for attention during our observing session. The Alpaca Farm and its parking lot, marked by the yellow pin, as viewed on Google Earth.